Every new blogger want to increase blog traffic fast, for this you need to index your blog fast.Indexing a new blog can take two weeks or more normally but we can fasten this process by simple tricks.Actually this process include two steps.In first step google bot collect information of your posts and add it in search index box.Once your posts will index google bot start crawling your blog. 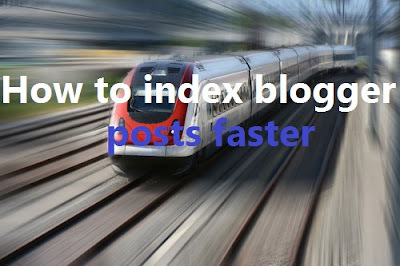 Google bot is very busy because billions of people update their blog daily and even hourly and it can not index all of them simultaneously but today i will show you how to speed up this process. How Google And Other search engines finds your blog? Sitemap is very important thing, it provide more information to Google and other search engine site crawlers that are bots to crawl and index your blog. It is a kind of notification to search engines about already publish post on your blog. When a sitemap is submitted to search engine it starts showing only submitted posts. Actually many newbies do not know about blogger seo and how search engine works and hence fails to get traffic. Pinging your blog tell search engine that your blog is updated and it helps to index your blog fast. You can ping your blog daily there is no limit but it is recommended to ping when you update your blog with fresh content. Use "Fetch As Google" in Google webmaster tools and Bing webmaster tools to submit your new posts and exclude those which you don't want to be indexed. You can find this tool in Google webmasters tools and Bing webmaster tools, I am not sure about Yandex. It will help to index your posts quickly. Also share your new posts on social media. It also helps you to get targeted traffic, pining posts tp pinterest or making a video related to post and give related link in the description will bring you targeted traffic as well as boost indexing process. A blog which have all posts shared more on social media is considered as an active blog and crawling of new posts is faster than other blogs. Submitting your blog to directories is very beneficial in indexing a new blog. There are paid as well as free directories available online. Dmoz is one of the very popular, human edited directory and its free, you can submit your blog to it and find other directories on Google! Try out these tips, once your blog is indexed you will see the difference in your traffic. Do not rush and keep patience. I look where i can make my blog load faster, and i find this article. but i am not satisfied with what i read there. one of the most problem i face is how slow my blog, https://muyibusiness.blogspot.com, is. i need to know how fast my blog is because there is more than 350 words with images in my blog. I dont think i can reduce great words of pages. it seem to waste time if i try it. any suggestion?